Five major types of bikeway provide for most bike network needs, based on the contextual guidance chart. This list is organized from more to less shared operation with automobiles. 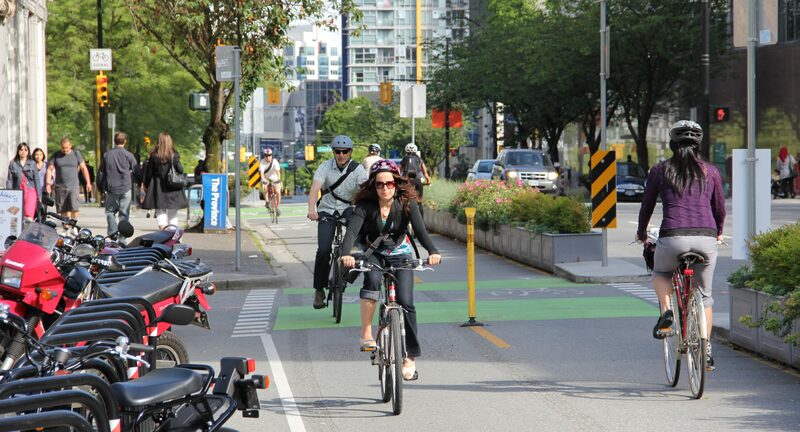 Each facility type is appropriate as an All Ages & Abilities bikeway in relevant street contexts. 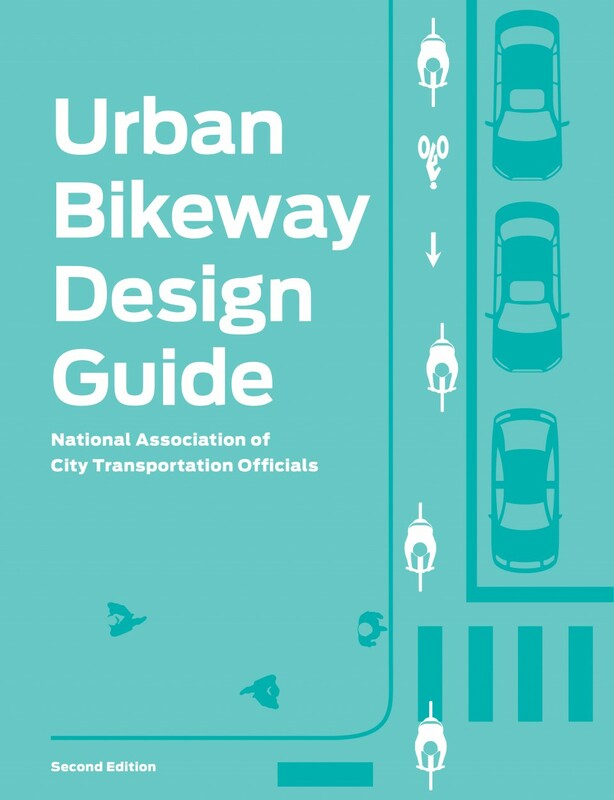 The NACTO Urban Bikeway Design Guide provides detailed guidance on bikeway facilities. 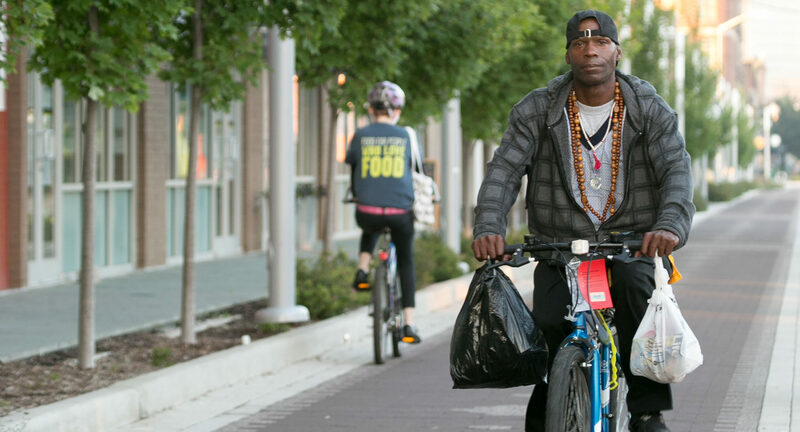 Low-Speed Shared Streets allow bicyclists to comfortably operate across the entire roadway. Shared streets target very low operating speeds for all users, typically no greater than 10 mph. The volume of people walking and bicycling should be much greater than vehicle volume to maintain comfort. Issues for bicycling in shared environments arise from conflicts with people walking, who may be expected at any point across the street’s width. Materials and street edges must be appropriate for bicycling; materials are often varied to delineate road space, but any seams or low mountable curbs must be designed to avoid creating fall hazards for bicyclists. 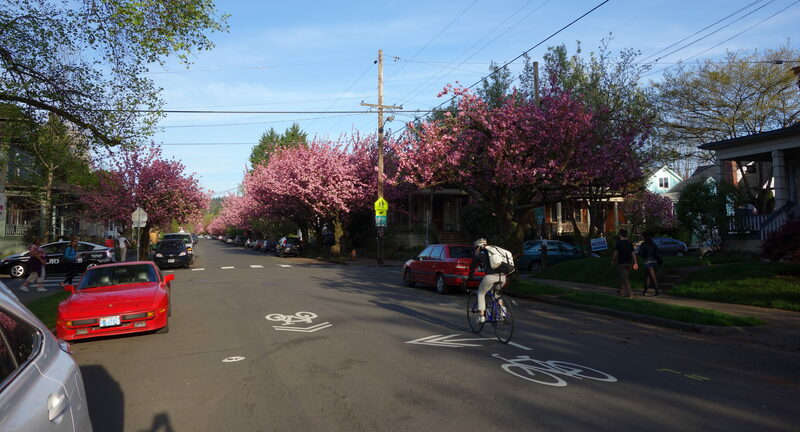 Bicycle Boulevards (or neighborhood greenways) provide continuous comfortable bicycle routes through the local street network. Bike Boulevards are characterized by slow motor vehicle speeds and low volumes. Sometimes these are present by the very nature of the street and its function (e.g. narrow streets with no major destinations), but sometimes design work is needed, such as adding traffic calming elements, filtering most motor vehicle traffic off, and/or prioritizing bicycles at major and minor street intersections. In this way, bicycling is made comfortable across the entire roadway. Directional markings and wayfinding signage provide riders with intuitive, coherent routing. 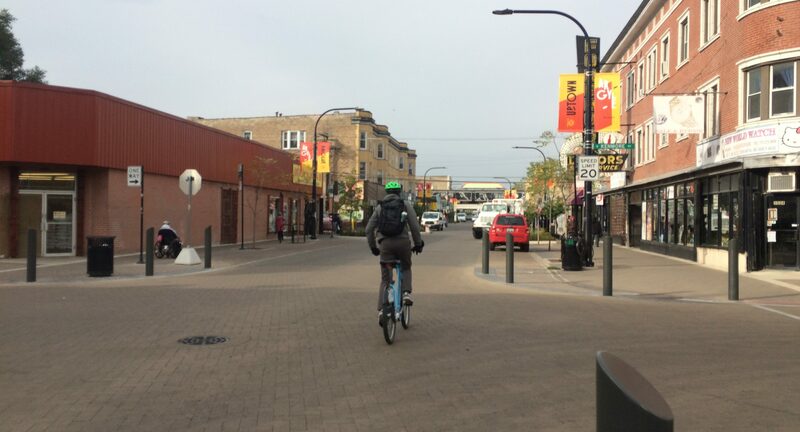 Buffered & Conventional Bicycle Lanes provide organized space for bicycling, and are often part of street reconfiguration projects that improve safety and comfort for all users. 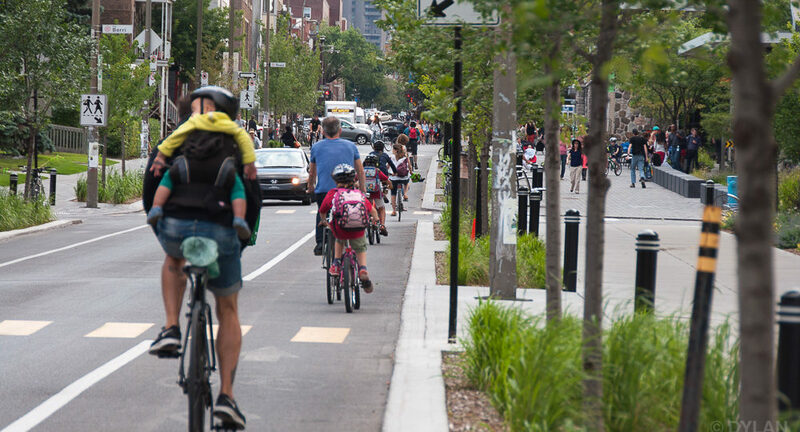 Bicycle lanes are an important tool to improve comfort and safety on streets where the number of passing events is too high for comfortable mixed-traffic bicycling, but where curbside activity, heavy vehicles, and lane invasion are not significant sources of conflict. Buffered bike lanes are almost always higher comfort than conventional bike lanes. In many cases, cross-sections with room for buffered bicycle lanes also have room for protected bicycle lanes. Protected Bicycle Lanes (also known as Separated Bike Lanes or Cycle Tracks) use a combination of horizontal separation (buffer distance) and vertical separation (e.g. flex posts, parked cars, or curbs) to protect people bicycling from motor vehicle traffic. The combination of lateral buffer distance and vertical separation elements (such as flexible delineators, curbs or height differences, or vehicle parking) can ameliorate most of the stressors of on-street bicycling. The robustness of bikeway separation often scales relative to adjacent traffic stress. Shared-Use & Bicycle Paths have in many cities served as the early spines of an All Ages & Abilities network. Paths can provide a continuous corridor, but usually do not take riders to their destinations. High pedestrian volumes, driveways, obtrusive bollards, sharp geometry, and crossings all degrade bicycling comfort, but often require long project timelines to eliminate. To become useful for transportation, paths work best when connected to an on-street network that meets the same high benchmark of rider comfort, and design provides bicycle-friendly geometry. Ideally, bicycles should be separated from pedestrians where significant volume of either mode is present, but where space limitations exist, multi-use paths are still valuable.